The RF500B base station resides at the computer site and serves as a link between field stations and repeater stations. It includes an RF500M radio modem connected to a PS150 power supply. The modem and power supply are then mounted to a 10 inch by 12 inch metal plate. The radio, antenna, antenna cable, and wall charger need to be ordered separately. Compatible radios include our RF320 series, our RF310 series, our RF300 series, and the DataRadio DL-3400. Software support is provided by LoggerNet. The RF500B provides the PS150 power suppl, RF500M modem, 18657 DB9-female null-modem cable (beige cable), 14291 field power cable (black cable), and a 10-in. x 12-in. metal plate. 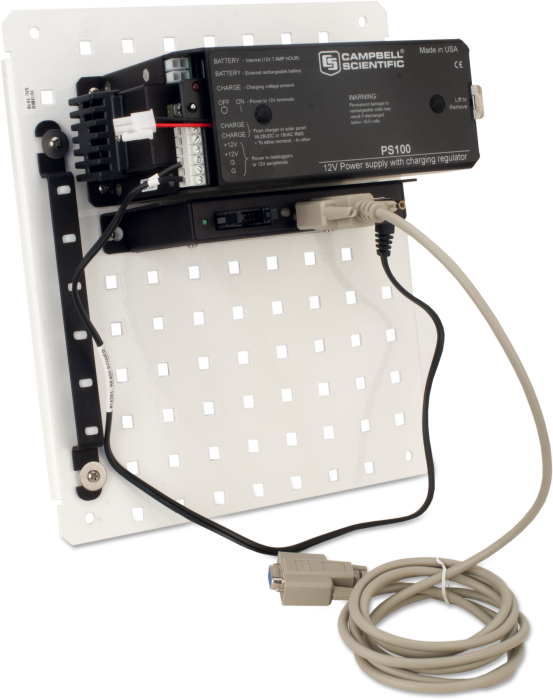 Considered the standard for the RF500M, the -PB OS uses TDRF polling to quickly and efficiently move data through a network. Each station can be individually dialed by LoggerNet. This OS is compatible with -TD, -PB, and our current generation of PakBus data loggers. The ALERT (Automated Local Evaluation in Real Time) OS allows for transmission, repeating, and reception of binary ALERT formatted data. It is a derivative of the -PB OS, and therefore supports both ALERT and TDRF communications (allowing true two-way communication with a station). This OS is compatible with the CR200(X)-series, CR800-series, CR1000, and CR3000 dataloggers. The dial OS works with both mixed-array and PakBus/table-based data loggers. Each station can be dialed by LoggerNet for downloading data, sending programs, and performing other tasks. Additionally, this OS allows stations to create point-to-point networks for sharing of measurement and control tasks. -NOTE- The RF500B is a kit containing components that have their own specifications. Time division polling and PakBus communications can be used in the same network as long as all of the data loggers are PakBus versions. #The -PB OS option for the RF500B is only compatible with the -PB and -TD OS for the CR510, CR10X, and CR23X. ‡The -DA OS option for the RF500B is NOT compatible with the -TD OS option for the CR510, CR10X, and CR23X. Three jumper settings allow the RF500B to be used with a variety of radios. Though not a requirement, it is a good idea to standardize your network to use a single radio type. This practice simplifies operations and maintenance and provides the highest degree of interstation compatibility possible. †The RF500B must have the -PB OS option to use a digital RS-232 radio with it. Networks can contain a mixture of RF500B base station and other Campbell Scientific base stations and radio modems assuming they have compatible operating systems (see chart below). * When taking advantage of TDRF and two-way communication.